Well, this did not take too long. Apple's iOS 5 has already been jailbroken even though the platform's upcoming iteration got announced only yesterday. If you are wondering how this could be possible considering that iOS 5 is not available to end users just yet, a preliminary version of the platform has been made available to developers, which is probably how the jailbreak author performed the exploit. It is surprising how easy it has been for the jailbreak community to obtain full control over iOS 5. The platform is supposed to feature over 200 new features and tweaks of all sorts, and apparently, defense against jailbreaking is not on the list. It is also interesting what software developers will come up with after obtaining root access to the platform. Let's not forget that iOS 5's notification system has been inspired by a tweak that debuted on jailbroken devices. The jailbreak comes in tethered flavor only, but an untethered solution will most probably come by the time iOS 5 goes live. Amazing! 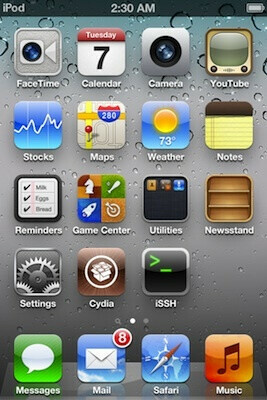 Just hours after WWDC, iOS 5 was JailBroken! thats a bad idea. this gives apple time to figure out how they jailbroke it and keep it from happening the same way. Oi.. never show your cards till the of the match people! Ever wonder if they did that on purpose? geesh. It's out of their hands. The limera1n exploit is device-based, not iOS-based. This shows that iOS5 is not a new OS, its still the same old OS, meanwhile Apple fan boys are screaming "New OS". Oh my gosh! No one is screaming "New OS!" That's just your imagination. It's you Android users that feels that Android's OS is constantly changing, which is so false. Don't be fooled by the skins. I'm very happy with iOS5 though. Thank you Android for the amazing notification system! I will be thoroughly enjoying it with all other goodies iPhone offers. You know it was a sad WWDC when a day later the only news coming out is that iOS has been jailbroken. i personally think that ios 5 is an upgrade but not enough for me to loose my current jailbreak, until ios 5 gets an untethered jailbreak then ill jailbreak but then all cydia apps have to get updated to. The reason ill use stock ios if i upgrade to the new iphone 4s. Yes, I am perplexed by this. ONLY hours to jailbreak iOS5, does this mean that iOS is STILL the same OS as before, with just some minor upgrades taken from other OS's? (notably Android & Microsoft) What is Apple doing with its R&D department. Is anyone going to rehash the iOS or are they going to beat a dead horse forever! This must be making Apple Fans CRAZY!